With sensitive skin comes a whole load of problems. I have blemishes, dry skin, oily skin, acne scarring, redness.. basically almost every skin problem you can think of. While I've managed to control my blemishes, redness and oily skin to an extent.. the dry patches and acne scarring are the main areas which I have yet to control...until now. I'm La Roche-Posay's biggest fan and once I heard there was a multi-purpose balm which could solve my problems.. I had to pick it up. 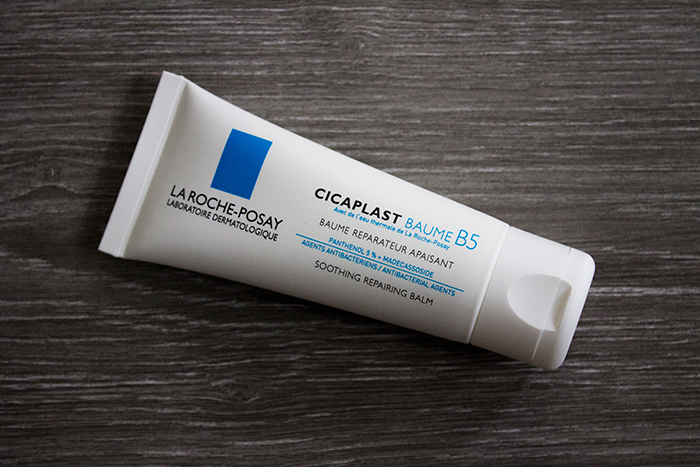 Here's the La Roche-Posay Cicaplast Baume B5 Soothing Repairing Balm and why you need it in your life. I'll start off by saying that currently, my skin has never looked better. I never thought I'd say that. I've found products that work for me and avoid the ones that cause me problems. Switching to a sensitive skincare routine and using French pharmacy brands has changed my skin dramatically. But I still have a long way to go. I recently started Dermarolling which I wrote a full post about to take care of my acne scarring and I mentioned that I've been using the La Roche-Posay Cicaplast Baume B5 Soothing Repairing Balm in conjunction with it. Basically, the balm is a very thick creamy formula which you can apply over your face or irritated areas to help heal your skin and soothe irritation. It's also great for dry patches and skin problems such as eczema or chapped skin. It's also antibacterial and anti-inflammatory. I like to think of it as a protective blanket for your face. The balm sort of feels like sunscreen so it's not the most pleasant product to leave on your skin and it sort of leaves a bit of a white cast over your face if applied thickly. I like to apply it at night so it can work it's magic and repair my skin overnight. Once I wake up, my skin looks so much more plump and hydrated. My acne scarred areas appear soothed and that dreaded dry patch over my eyebrows has miraculously disappeared. It truly is a wonder product and once mine runs out, I'll definitely be picking up the larger 100ml tube. Can La Roche-Posay do no wrong? I think so.